Can upgrade normal weapons (Hardstone / Sharpstone) and 'Quality' items (Clearstone). Can repair any damaged equipment for souls. Cost varies due to amount of durability repaired and the power/ rarity of the item. All other upgrades must be made by Blacksmith Ed in Stonefang Tunnel. Hm? You new here? Are you here for my services? The Names Boldwin… Just an ordinary blacksmith. It's simple. Just bring me all the souls you can. In trade, I'll give you weapons. Or forge ones you already have. With your souls, I can eke out a living, and with my weapons, you can go on living. Perhaps you've already heard, but there's another blacksmith at the enterance of Stonefang mine. He's an eccentric old man, but he knows his trade well. He's the only sane one left in a town of soul-starved men. If you do meet him… Yeah… well, forget it, that stubborn old n'er do well will just ignore you. 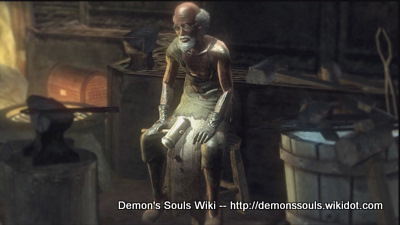 There aren't enough blacksmiths in this temple to handle all the work. Only certain ores can be used to forge weapons, but you'll just have to make do. And be thankful that I'm still of good health. Well' old Ed's still up to his old strange ways, is he? Hah hah, even the Demons don't know what to do with him, hmm? Back in my younger years, I had the strength of an ox. The miners would always ask me to clear out the bearbugs, which I pummelled with my bare hands! But even I couldn't beat 'em. So I lobbed them into the lava pits! Gah hah hah hah hah! I'm pretty strong myself, but even I don't compare to old Ed. The man's a beast, I tell you! The man must eat dragon tails and wishing stones. If you heed my advice, you'll avoid crossing him. I reckon he'd prove a lot more trouble than most Demons! Oh, good day to you. I can forge weapons for you, for a fair price. Do come back alive. I need your business. What's the hurry? Where're you off to? I'll excuse the rudeness, but only this once. You're lucky that it's me and not one of the other barbaric louts. What in blazes do you think you're doing?! Have you lost your wretched senses? I am Boldwin, and I am not going down without a fight!